Darren Sammy has retired from Test cricket after being replaced as West Indies captain by Denesh Ramdin. The all-rounder has led the Test side since 2010 and led the side to series victories over Bangladesh, Zimbabwe and New Zealand during his spell in charge. But his overall record disappointed as West Indies lost four of their last five Tests in India and New Zealand. However, the 30-year-old St Lucian will remain as Twenty20 skipper and stay involved in the one-day side. "We thank Darren for his energetic and resolute leadership over the past four years and we continue to see his role as the Twenty20 captain as a critical one," said West Indies Cricket Board (WICB) president Dave Cameron. West Indies will now have different captains for all the three international formats - wicketkeeper Ramdin for Tests, Sammy with the T20 side and all-rounder Dwayne Bravo for the one-day international squad. Ramdin will begin his spell as captain by leading West Indies in the three-Test home series against New Zealand, which starts in Kingston, Jamaica on 8 June. The Trinidadian right-hander has played 56 Tests, scoring 2,235 runs at an average of 27.25, including four centuries, and taking 156 catches. "It is an honour to be named as captain of the West Indies Test team," he said. 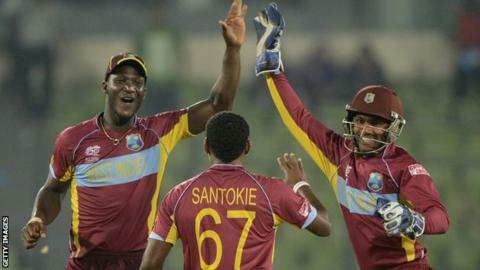 "This is a huge opportunity and as a unit we are capable of representing the people of the West Indies. "I am taking over from Darren who did a good job while he was at the helm. He is a very humble and hardworking cricketer and during his time at the helm we won six matches and he gave his all to the job."